This herb is the hairy, non-ossificying young born of male deer or stag of Cervus nippon Temminck or C. elaphus Linnaeus, vertebrae of the family Cervidae. 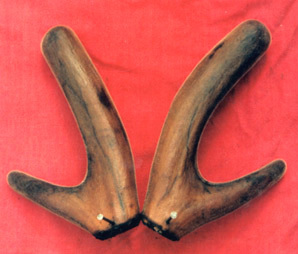 Commonly, the former is called Hua Lu Rong (pilose antler from Cervus nippon Temminck), and the latter is Ma Lu Rong (that from C. elaphus Linnaeus). In northeast, northwest and southwest of China. Sawed and processed in summer or autumn. Hua Lu Rong is slightly stench in smell, slightly salty in flavor, Ma Lu Rong is stinking in smell, salty in flavor. The good Hua Lu Rong refers to that of thick and strong, straight and round, well-developed tip, soft and red-yellow hair with smooth and shiny red-brown fur. The good Ma Lu Rong refers to that of plump but light, with grey-black or grey-yellow hair, without ridges at the lower part. Cut into thin pieces and smashed into powder. Sweet and salty, warm; kidney and liver meridians entered. Tonify kidney and liver, supplement essence and blood, strengthen tendons and bones, reinforce thoroughfare and conception vessels, and promote healing by expelling pus through strengthening vital qi. (Collected Prescriptions from Sihe Pavilion), it is used with Ren Shen, Huang Qi, Shu Di Huang, Rou Cong Rong and other herbs in Lu Rong Wan from Sheng Hui Fang. Lu Rong can tonify liver and kidney, supplement essence and blood, and strengthen tendons and bones. For deficiency of both liver and kidney, insufficiency of essence and blood marked by weak extremities, hypoevolution, inclosure of fontanel and five retardations in the children. It is often combined with other herbs that can tonify liver and kidney and supplement essence and blood, for instance, it is used with Shu Di Huang, Shan Yao, Shan Zhu Yu in Jia Wei Di Huang Wan from Yi Zong Jin Jian. 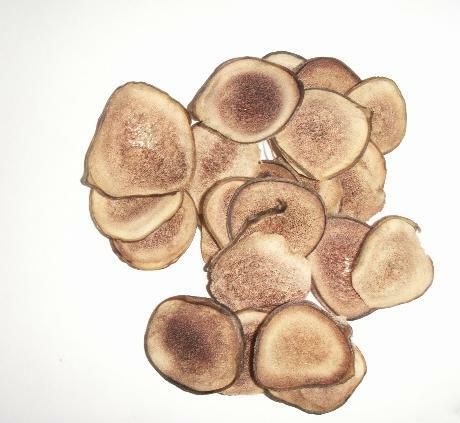 For fracture, it is combined with Gu Sui Bu, Xu Duan, Zi Ran Tong and other blood-circulation-promoting herbs to heal. It can not only tonify liver and kidney, supplement essence and blood, but also regulate the function of the thoroughfare, conception and belt vessels. Therefore, it is indicated for menorrhagia, metrostaxis cdused by debility of thoroughfare, conception and belt vessels due to liver and kidney deficiency. For menorrhagia or metrostaxis, it is combined with blood-nourishing and bleeding-stopping herbs, for instance, it is used with Dang Gui, E Jiao, Hai Piao Xiao, Pu Huang from Qian Jin Fang. For leukorrhagia in thin quality, it is used with herbs that astringe leukorrhea through reinforcing kidney, such as Gou Ji, Lian Zi, Hai Piao Xiao. Lu Rong can expel toxin through warming kidney yang and tonifying essence and blood. For deteriorated or chronic ulcer caused by deficiency of yang, essence and blood, it is often used with qi and blood tonifying, yang-warming, blood-vessels-smoothing and blood-activating herbs, such as Huang Qi, Dang Shen, Rou Gui. 1~3 g, ground into fine powder to be swallowed. Three times a day, or prepared in bolus, compound powder, or medicated wine. It is contraindicated m cases of yin deficiency with effulgent fire, heat in blood system excessive stomach-fire, phlegm heat in lung and attacking by external pathogen; and it should be used from small dosage to treatmental dosage because of its warm, ascending property and tonifying yang heat action, and if it was used in large amount suddenly, it would result in vertigo, blood-shot eyes and syncope due to yang ascending and wind stirring; or epistaxis hematemesis, hematuria due to excessive fire.